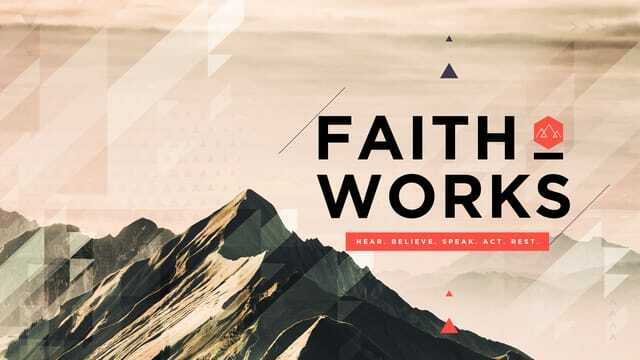 We want to bring faith to life by helping people belong through connection, become disciples, and build the Kingdom of God. No matter where you are at in your faith journey - familiar with faith, far from faith, or fallen from faith - we want you to know you belong here! Do you text? We do too! We have a dedicated texting line, 620-604-9280, that you can text keywords to help you connect. NEWS - helps you stay informed. Connect Groups start meeting this week! Faith is the activity of believing in our heart and spirit, which gives us the ability to be intimately acquainted with the person, purpose and promises of God. 3. God is good to me. 4. God is good through me. Somewhere between hearing and believing is a choice. Want to talk it over and connect this message to your everyday life? Good, us to! Change happens when we apply what learn and share it within community. Answer these questions so you can share with your Connect Group or talk it over with a personal friend. Faith Believes. We can’t believe everything we hear. But when God speaks, we need to choose to believe Him. Sometimes that is easier said than done. How can we truly believe what we hear from God? Somewhere between hearing and believing is a choice we make. • Which one do you wish existed more, big foot or unicorns? • Would your friends consider you gullible? • Read Hebrew 3:7-19. What are some things you observe about faith in this passage? • Somewhere between hearing God’s voice and believing is a choice. Why do you think that choice is difficult at times? How can we choose to believe? • Have you walked through a tough time and come out with stronger faith? How did your faith grow during that time? Tell your group about it. • Pastor said that “God wants to be our only option.” What are some “options” you’ve chosen over God during your life? • Is there a promise from God you need to be actively believing for? Share it with your group. Which one Of the following will you do this week? • Ask God to reveal any unbelief (certainty, or even familiarity) that might be in you heart. • Write down what you want to begin actively believing for. Be specific. • Ask your group for prayer if you have been walking through a “test” in your life. God, we want to believe, but help our unbelief! We want to honor you and have our faith grow. We want to be at the place where we believe that you are good through us! May we believe what we hear from you. In Jesus’ name, Amen.